In addition to Tuesday’s release of Mission Of Burma’s 5th (!) 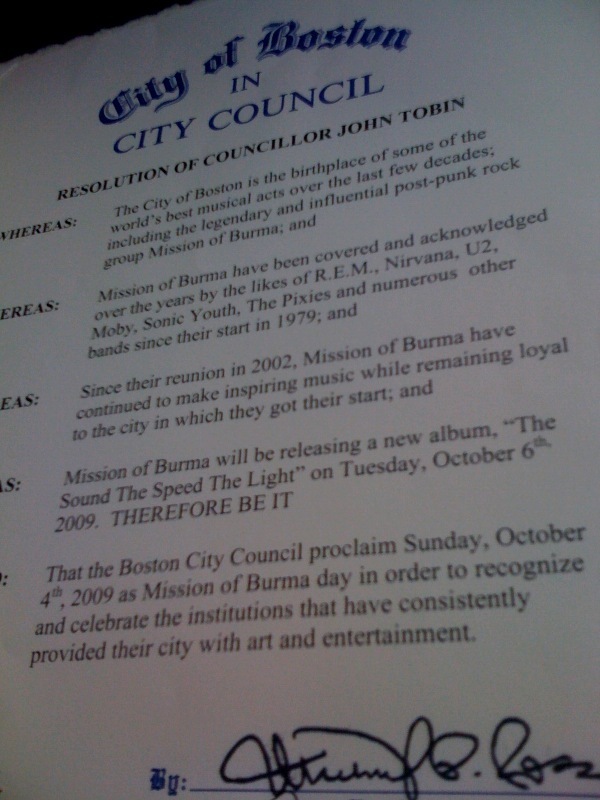 studio album, ‘The Sound, The Speed, The Light’ and Sunday’s free outdoor concert at M.I.T., Boston’s City Council have wisely declared October 4, 2009, “Mission Of Burma Day”. Y’know, the City Council gets a bad rap every now and then, but for one day at least, our cynicism about local politics has been replaced by whole-hearted enthusiasm (and a desire to sell more copies of a fantastic new Burma 7″ hardly enough of you have checked out). GC – When i said we had to go all “Blagojevich” on this campaign, I never thought it would get us this far! In a few years they’ll name a section of I-90 for them. Seriously, congratulations, guys.